Dongping Wei and Tetsuzo Seno. 1998. Determination of the Amurian Plate Motion. Mantle Dynamics and Plate Interactions in East Asia, Geodynamics Series. v.27, edited by M. F. J. Flower et al., 419p, AGU, Washington D.C. 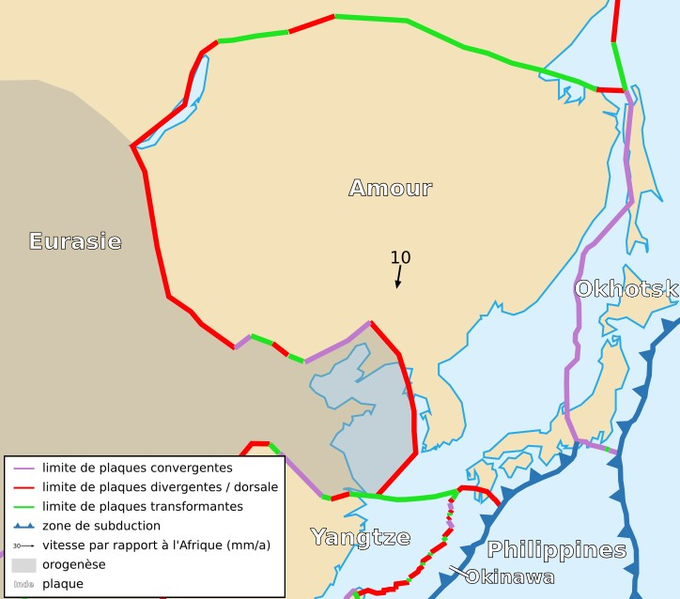 The Amurian plate (or Amur Plate) is located in northeastern Asian, covering Manchuria, the Korean Peninsula, western Japan, and part of southeast Russia below Lake Baikal. Once thought to be part of the Eurasian Plate, the “Amur Microplate” was proposed by Savostin et al. [1982, 1983] to be a distinct microplate moving southeast with respect to the Eurasian plate. Sengör, Cêlal A. M., and Boris A. Natal’in. "TECTONICS OF THE ALTAIDS: AN EXAMPLE OF A TURKIC-TYPE OROGEN." (n.d.): 535-46. Şengör, A. M. C., B. A. Natal'in, and V. S. Burtman. "Evolution of the Altaid Tectonic Collage and Palaeozoic Crustal Growth in Eurasia." Nature 364.6435 (1993): 299-307. 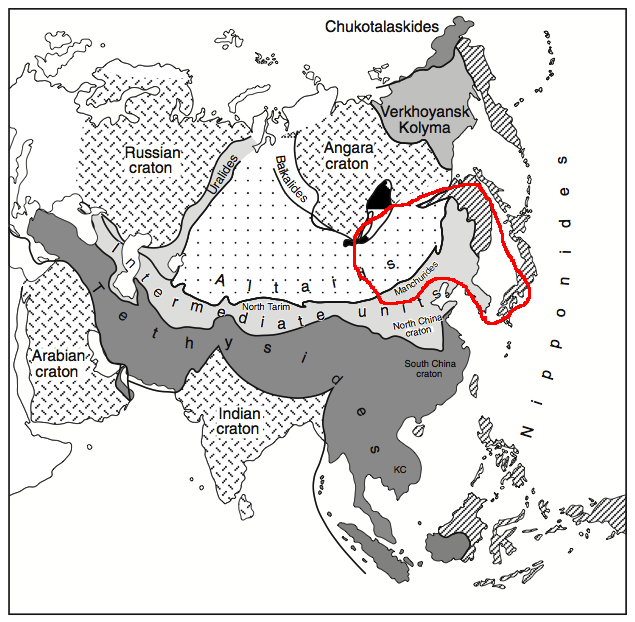 The majority of the Amurian plate is made up of the Altaids Orogenic complex, the rest being the North China Craton. The Altaids is one of the largest accretionary orogens on Earth, forming from the late Proterozoic to the early Mesozoic . The geology of the Altaids is composed mainly of large positive granitoids and multiple phases of alkaline magmatism . The Altaids tectonic collage, as it is called, is made of many juvenile tectonic units. These include fragments of island arcs, seamounts, oceanic islands, and ophiolites . Based on earthquake epicenters and GPS data, the boundaries of the Amurian plate have for the most part been agreed upon. To the North it is bounded by the Eurasian plate with a sinistral transform fault along the Stanovoy Mountains and a rift zone in the Baikal Lake region. To the East is a convergent boundary with the Okhotsk plate. To the southeast it is bounded by the Philippine Sea plate, which is being subducted beneath the Amurian plate along the Nankai Trough. The velocity of the Amurian plate with respect to the Eurasian plate is relatively low. Using GPS data and the MORVEL (Mid-Ocean Ridge Velocity) computer model (Demets et. al. 2010) calculated that the Amurian plate moves eastward at 3.8 mm/yr relative to the Eurasian plate . This MORVEL estimate is consistent with Calais et al. (2003) GPS measurements of the Baikal Rift Zone which found extensional displacement to be 3-4 mm/yr . The Nankai Trough marks the boundary between the Amurian (AM) and Philippine Sea (PS) plates. This feature is the result of the PS plate being subducted under the AM plate. The relative velocity of this subduction zone is much larger that of the AM-EU boundary. Using MORVEL,  predicts a WNW-directed convergence of 58.4 mm/yr. However, there is some disagreement over this rate. Sella et al. (2002) estimates a rate of 31 mm/yr and Kreemer et al. (2003) estimates a rate of 67 mm/yr. Averaging these three values gives an subduction rate of ~50 mm/yr. The Nankai Trough presents the potential for economic opportunity as well as major natural disaster for Japan. As subduction occurs, sediments from the ocean floor are scraped off and deposited in the trough, forming an “accretionary prism” . These sediments contain a large amount of methane hydrates, which are ice-like materials formed from a porous framework of H2O molecules filled with methane . The methane hydrates can and are already being mined. Japan Oil, Gas and Metals National Corp. has already established an offshore well capable of extracting 10,000 cubic meters of gas per day . Unfortunately, the Nankai Trough subduction zone also poses the threat of a massive earthquake in the future. A government panel of experts in Japan have warned of the possibility of a major earthquake in the Nankai Trough . The potential earthquake could be as large as magnitude 9.1, which the government panel estimated could kill ~320,000 people . Demets, Charles, Richard G. Gordon, and Donald F. Argus. "Geologically Current Plate Motions." Geophysical Journal International 181.1 (2010): 1-80. Yamada, Yasuhiro, Kei Baba, Ayumu Miyakawa, and Toshifumi Matsuoka. "Granular Experiments of Thrust Wedges: Insights Relevant to Methane Hydrate Exploration at the Nankai Accretionary Prism." Marine and Petroleum Geology51 (2014): 34-48. Koji, Ochiai, Masao Hayashi, Nobutaka Oikawa, Shoshiro Shimizu, Masaru Nakamizu, Tetsuo Yonezawa, Kuniaki Takayama, Masami Hato, Kei Baba, and Sumito Morita. 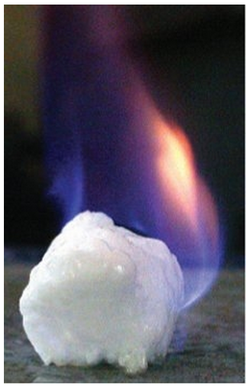 "The Estimation for the Resources of Methane Hydrate in the Nankai Trough, Offshore Japan." (n.d.): n. pag. Web. 28 Jan. 2014. <http://www.igu.org/html/wgc2003/WGC_pdffiles/10428_1045822315_12603_1.pdf>. Liu, Han-Shou. "Geodynamics of the Baikal-Stanovoy Seismic Belt." Physics of the Earth and Planetary Interiors 31.1 (1983): 77-82. KUROSAWA, TAIRIKU. "Experts Recommend Preparation over Prediction for Major Quake." The Asahi Shimbun. N.p., n.d. Web. 30 Jan. 2014. <https://ajw.asahi.com/article/behind_news/social_affairs/AJ201305290076>. Xiao, Wenjiao, Baochun Huang, Chunming Han, Shu Sun, and Jiliang Li. "A Review of the Western Part of the Altaids: A Key to Understanding the Architecture of Accretionary Orogens." Gondwana Research 18.2-3 (2010): 253-73.